Karla Rose Nectarine | Gurney's Seed & Nursery Co.
For Coastal and Lower South gardens. 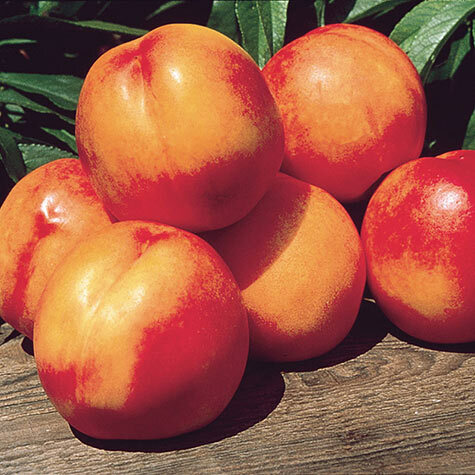 Medium-sized fruit with white flesh has sweet, traditional nectarine flavor. 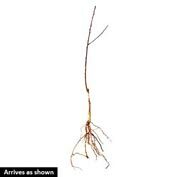 Well adapted to Coastal and Lower South, and into northern reaches of Zone 8. Ripens in June, requires 700 chill hours. Self-fruitful; semi-freestone. Zones 8–9. 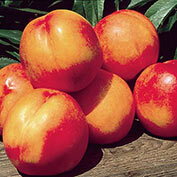 Fruit: Medium-sized fruit with white flesh has sweet, traditional nectarine flavor. Semi-freestone. Zone: 8-9; Well adapted to Coastal and Lower South, and into northern reaches of Zone 8. Flower Form: Whitish to light pink blossoms. Size: If properly thinned the fruit may reach 2 1/2 to 3 inches in diameter.